Dunwoody Hairslylist - Dunwoody Hair Salon | Your Professional Hair Studio! 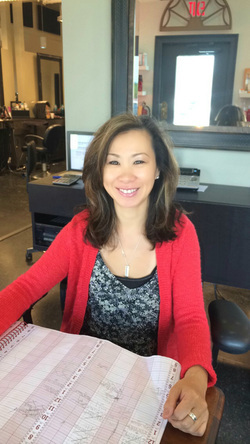 Miki is a master hairstylist with over 25 years of international experience. She is a second generation hairstylist that grew up watching her mother work in the family salon in Sapporo, Japan. For the past 15 years, she has been working in hair salons in the Dunwoody, Georgia area. Prior to working in Dunwoody, Miki spent over 10 years developing her skills at fashionable hair salons in Tokyo, London, and Atlanta. Miki has a special ability to match custom styles to individual tastes for short, medium, and long hair. Her specialty is creating natural looking hairstyles that give each of her clients a confident and professional appearance. For her female clients, she also has experience creating fun and glamorous styles using various cutting and coloring techniques. Miki's passion for her work is evident by her enthusiastic client interaction. She enjoys building professional relationships with each of her clients, some of which have been with her for more than 10 years. But, most of all, she enjoys seeing a happy, satisfied look on each client's face when they look in the mirror.